BobCAD-CAM announces the opening of their first office in the state of Texas. The company's new Houston office will be positioned to service Texas based clients and better meet the growing demand in the state. 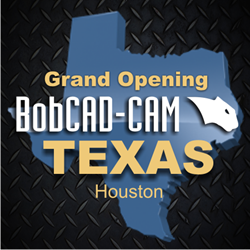 BobCAD-CAM, Inc., leading provider of affordable CAD-CAM software, announced today the opening of a new office in Houston to better meet the increased demand for their software throughout Texas. The need to develop operations in Texas became increasingly important as the demand for BobCAD-CAM, Inc. products has grown exponentially in the southern region. The new location will be the company’s first expansion office in the US since relocating their headquarters to Clearwater, FL. In conjunction with the opening of the new office, BobCAD-CAM, Inc. has also announced the hiring of David Brown as an account manager that will work out of the company’s new location. David’s primary responsibility will be to ensure BobCAD-CAM, Inc.’s new and existing clients receive the highest quality service and affordable CAD-CAM software solutions. Specifically, he’ll be positioned to address the expanding customer demand in Texas. With a background in machining and manufacturing, David provides a unique perspective and understanding of the company’s client needs. BobCAD-CAM has provided CAD/CAM CNC Software products to the global manufacturing industry for over 25 years. BobCAD-CAM software can be found to increase cnc productivity for many applications including educational and independent hobby home use. Products include machining technology for 2, 3, 4 & 5 Axis CNC Milling, Routing, WaterJet, Plasma and Laser machines as well as 2 Axis CNC Lathe. BobCAD-CAM also provides a variety of quality training products that include regional and online training classes or private sessions tailored to specific applications. Professional certification can be acquired as well as multi-tiered technical support solutions to their service customers. For more information on the company’s new Houston Texas branch, contact BobCAD-CAM, Inc. at 877-262-2231 or 727-442-3554.